Well ... we have traveled a long and lovely photo-art path together ... right into 2014. How amazing!!! And how delightful to have had your company on this learning journey! Can you imagine the photo art we will create and view in the year to come? I am excited and inspired just by the thought of it!! 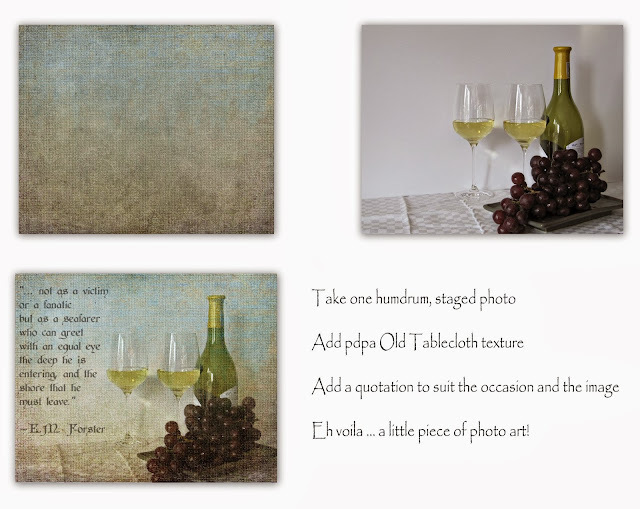 To download a free copy of pdpa Old Tablecloth texture, simply smile and click HERE. An example of one effect you can achieve with this texture. It's time for Photo Art Friday. Are you ready? You can post * any piece of photo art here each month. You can use the creative prompts/themes/challenges that I offer each month, too. I find myself a little resistant to choosing just one word to guide me through the year ... not quite sure why. Maybe it's because my real motto from last year is leaking into this year: "I'd rather be painting!" Last year I did formally choose the word "presence". While being "present" to my inner process, as I negotiated my way through 2013, it was evident that I spend a lot of time doing exactly what I am doing now - resisting what life, duty, inner and outer expectations, traditions, etc. call on me to do. I discovered that I consistently resist the simplest of things - the mundane, little duties of life such as grocery shopping, making phone calls, using new gadgets and new purchases (e.g. Lightroom, CS6), spring cleaning, writing new posts for my blog, etc. etc. E.g. : "People are too busy on the weekend to read my post - I'll do one during the week." "I'll work out of my Lightroom files next week, it's so much easier to just grab photos out of Picasa." "I love the challenge of making a good meal from whatever rations can be found in the cupboard." "I don't want to phone him now and interrupt him at work." With the energy spent resisting and procrastinating, I could have accomplished many of the tasks twice over - but resisting seems to be an insidious, long-standing habit. I am not talking about social/political non-resistance but rather my personal, inner habit of resistance to what is. I just want to stop over-thinking what I am called to do by the way life unfolds, and simply do it. Yes, I'm thinking of that old Nike phrase too! 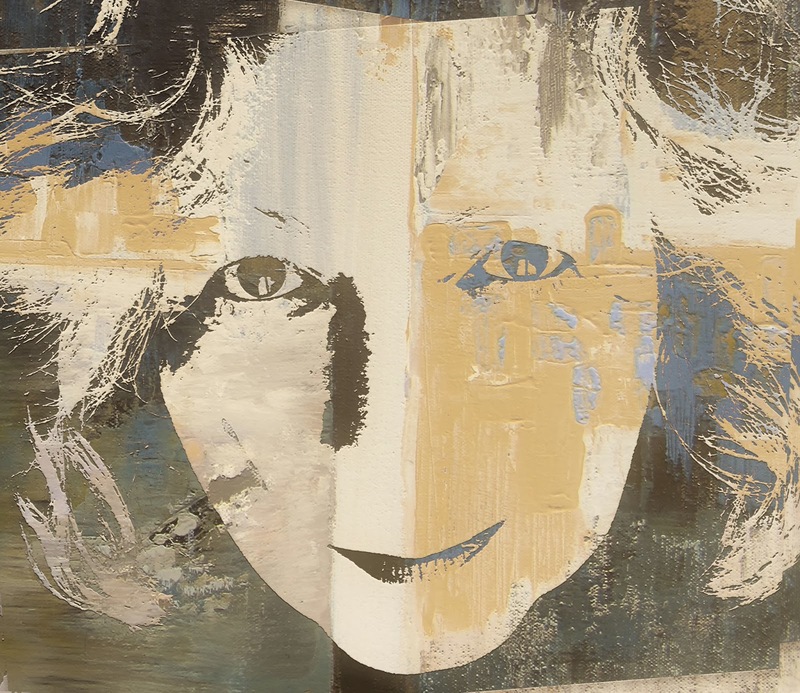 I've used a piece of photo-art that includes an abstracted image of myself so that I cannot resist the evidence of who should be contemplating non-resistance! 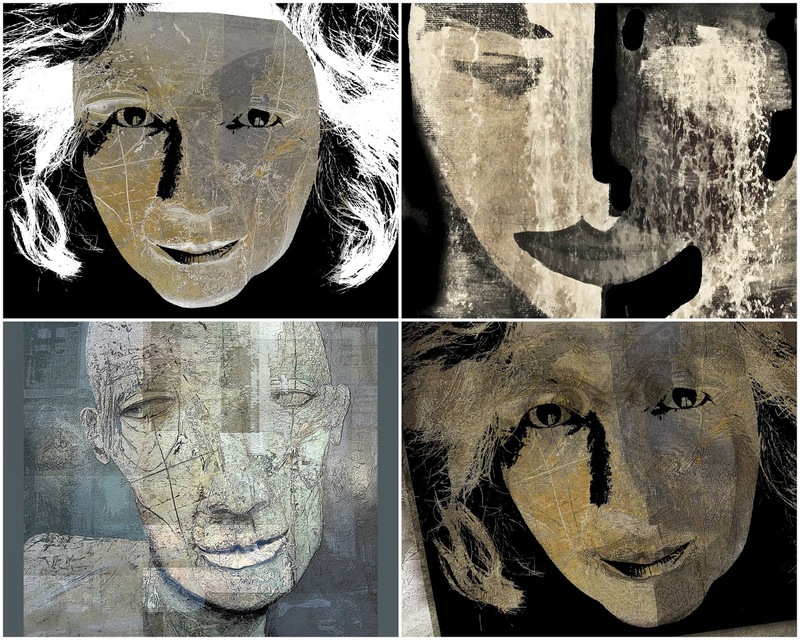 The above image is a composite of a photo of myself with some of my textures, a photograph of one of my painted images of a face, and a photograph of a painting found in a gallery window of a rather intriguing face that I edited in PSE. (So those shadowy areas really aren't entirely my eyebrows, mouth or nostrils!) Some of the elements used in the above composite can be seen in the collage below. These may not be my favorite pieces of photo art from 2013, and weird tho' they may be, I had so much fun placing image on top of image, adding textures and seeing what warped portrait emerged! Interesting your self portrait, and also a beautiful and evocative representation of wine! Ok you wrote your post with in mind, amazing. Boundary was my word for last year, could not give myself any so I am using a phrase this year. These are fabulous pieces of art Bonnie. Wishing you success with all you set out to accomplish in 2014. Happy new year, Bonnie! And thanks for hosting - it's always great fun! Ahhhh- truly its a more sophisticated version of my own "embrace" concept for last year. But yes- the constant "shrinking back" or resisting, when leaning in was ever so more productive. I love "seeing" you in your artwork- truly between your words and the physical features you've allowed to show- I feel like I'd recognize you anywhere! ...tomorrow, I think about it tomorrow. thanks! I'll be back with a photo! Happy New Year! I don't think in themes, so I tend to skip over such discussions....wishing that I DID think creatively, now and then. Thank you, thank you for that beautiful texture---and for the inspiration of the still life set-up. I've decided that I'm going to work on still life this year in my photography. 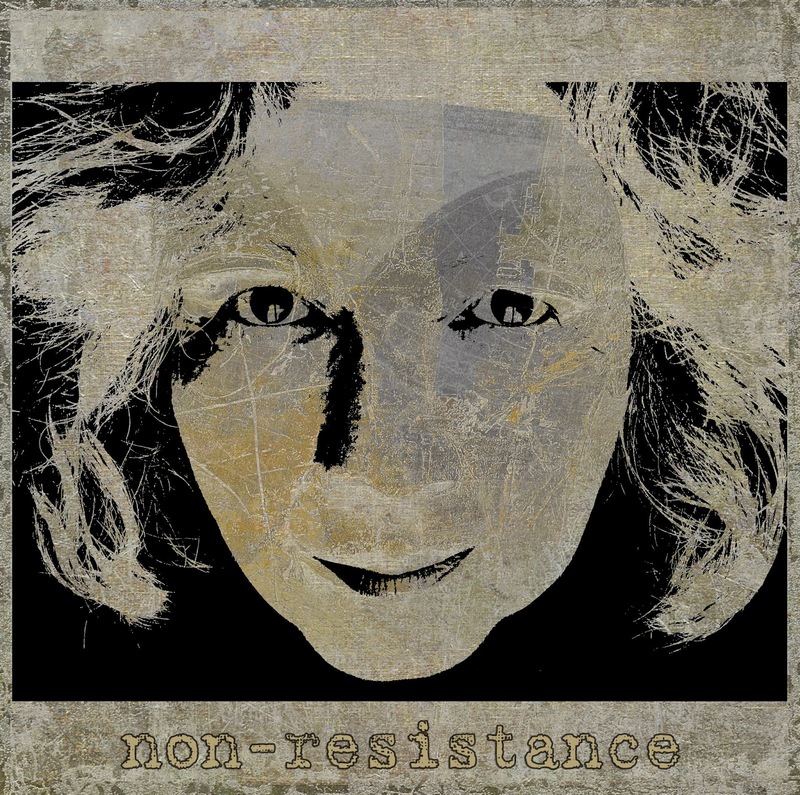 Non-resistance....now you could be talking about me too. The resistance to grocery shop, or learn my elements...yep I really get that. That is a great word, one I will add to mine. And I love that you put your word with a photo of yourself and love how they turned out. I forgot to say, but I used your new free texture on my photo. I struggled to find the right photo to go with my word, not very artsy this month with mine. Speaking of which, what is our theme for next month? Happy New Year to you Bonnie. Happy New Year, Bonnie! Your art parties are always so fun, and your textures are fabulous! I love working with them. Thank you for your generosity! It's so refreshing to be honest with ourselves, isn't it? Here's to an intentional, non-resistant 2014! Happy New Year! Great post. I love the effect of the new texture, and I love your portrait pieces. What a wonderful start to the new year! Happy New Year, Bonnie. Wow, these are just truly creative and special. Thanks for the lovely texture. I can relate to so much of what you share! As I 'learn from trees' this year (no, I'm not joking!) one of the things I think about is blooming where I'm planted. Doing, in my present space what needs to be done and ... well ... just getting it done simply, swiftly and well. Love your determined non-resistance! Going to add that word to my journal!! non-resistance is an excellent word choice. I think you are right that often times more energy goes into resisting than just letting things turn out they will anyways. Thank you very much , lovely compositions ! Happy New Year to you Bonnie and thanks for keeping PAF alive and going. From your art this time I favor the last one with only your facial features. Thank you for the new texture!! What a fabulous find this blog is. I came through a link from another blog and was so pleased to see I could buy MORE textures :) I now have 5 of your very cool textures sitting in your very own folder on my E drive. I'll be back for more since I'm addicted to texture! BTW...my word for 2014 is authenticity...I've spent too many years trying to be anyone but myself :) In the New Year I plan to 'shoot my eye' out with so many photos that I'll never be able to use all of the textures in my folders. Photography has been my go to artistic outlet but I never thought I would ever want to make my living at it...now I realize it's the one thing that makes my soul sing!! I'll be back up to link again! super idea using yourself as an example of the word you pick for the year..The many processing you did on each image gives me ideas to try and master..I like the last photo of your self image..I like color.. I picked motivation...I want it to be a habit so I can change bad habits into good --wink! 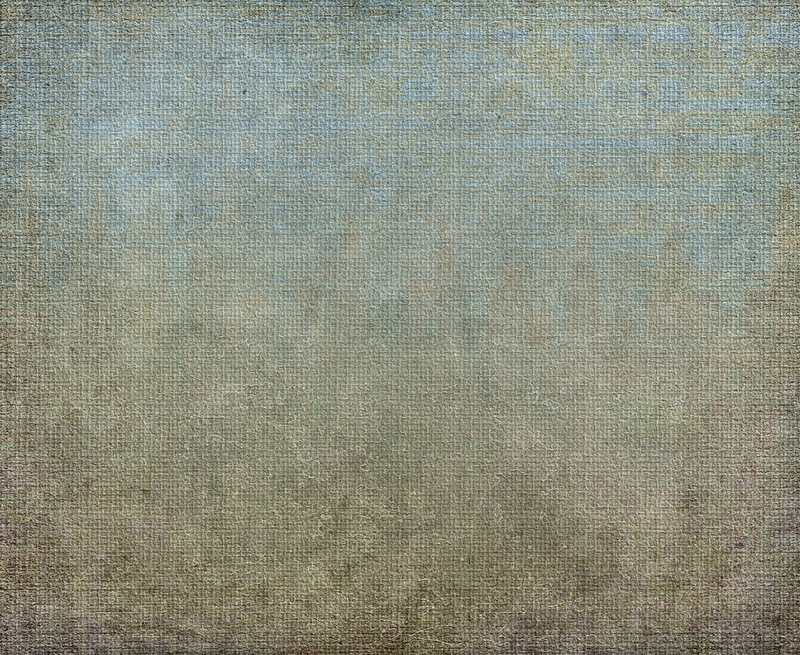 Thank you for the texture Bonnie it is beautiful, I went back and used it on my mistletoe abstract. I'll link up soon. I love your post, my word in 2013 was Learn and it really helped me with this habit of procrastinating. The problem is, for me anyway, there is so much wonderful inspiration 'out there' so many things I want to try, there are not enough hours in the day!! How did I ever fit in going to work ;) I am so thrilled that I managed to be able to hang something in your wonderful gallery this month. I love your portrait and the new working on it, it has inspired me to work again on something similar I started last year. Happy new year to you, Bonnie and thank you for the lovely new texture. Love joining up here and being inspired by each individual artist. The authenticity and vulnerability shared is so refreshing. Your collage is my favourite, I think, but I really enjoy the use of colour in the final image. Looking forward to another great year of participation in PAF. Blessings to you and your loved ones in the New Year. Happy New Year! What wonderful and evocative selfies you've created! I love the overlaid textures...gives each one quite a unique feeling. Happy new year to everyone! Thank you again dear Bonnie for your fantastic texture! I added my link to Flickr this time. I will post a picture with my word of the year on my blog a bit later. I just felt I couldn`t do it yet; I had to post a pic of our cat in heaven first. Just found your site by following Inspired By June and she mentioned she uses your textures. I do make my own sometimes, but enjoy others also. Thank you so much for the free texture and the offer to purchase the smaller sets. I took advantage of that offer and purchased the Old World Charm and the Notes de Provence. Can't wait to use them on my photo blog. They are so lovely and what a great price. You will find my order under Patricia Bird and I use Peabea my psyeudanym or just a better way than using my initials on the internet ~smiles~. I'm going now to check out your Photo Art Friday. I like your self-portraits, Bonnie. Thanks for the lovely new texture. Thanks for the texture and the inspiration! And a very Happy, non-resistant, new year to you! I love your ghostly like portrait. Very mysterious and cryptic.